Audiolab announces feature-packed 8300CDQ CD player | What Hi-Fi? CD players are like buses at the moment. We wait ages for news of a newcomer to the market, and then three announcements come along almost at once. Following the recent launch of Exposure and Rotel CD spinners, Audiolab is introducing the all-new 8300CDQ (£1100). It’s the latest addition to the brand’s 8300 Series, and the second CD player in the range alongside the 8300CD (£999). Like the 8300CD, the 8300CDQ is a slot-loading player offering digital pre-amplification alongside digital volume control. But inevitably to justify its existence (and extra cost) next to its sibling – after all, how many hi-fi ranges still feature more than one CD player? – the new machine offers a fair bit more. For one, the 8300CDQ adds an analogue preamp that feeds three line-level RCA inputs, the circuitry for which is protected from noise interference thanks to a carefully chosen physical layout. There’s also a dedicated headphone amplifier, which drives a 6.3mm front-panel socket, as well as full decoding of MQA (Master Quality Authenticated) files played via its USB input. Audiolab’s MQA decoding solution was specially developed to ensure the unfolding and playback of MQA files, which can vary depending on the method, made good on the format’s utmost potential. 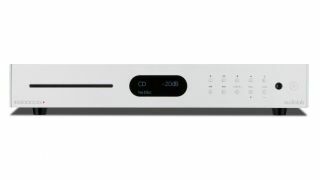 Its five digital inputs comprise single asynchronous USB and twin coaxial and optical connections, with peak file support reaching 32-bit/384kHz and DSD256. The 32-bit Delta-Sigma DAC technology that is found the company’s 8200CD and 8200CDQ players is utilised here too, complete with architecture designed to eliminate jitter for a performance as noise-free as possible. Audiolab also uses a separate, isolating circuit that works to keep any artefacts from the analogue domain from interfering with the DAC’s sonic performance. In addition to the headphone socket, outputs include coaxial, optical, XLR and RCA. And last but not least, Audiolab 8300CDQ owners can choose between seven playback filters for PCM data (including CD) and four filters for DSD files. The Audiolab 8300CDQ is available this month in a choice of silver or black, priced £1099.95.